Congratulations to Wiktoria and Elliott who both graded on Sunday. 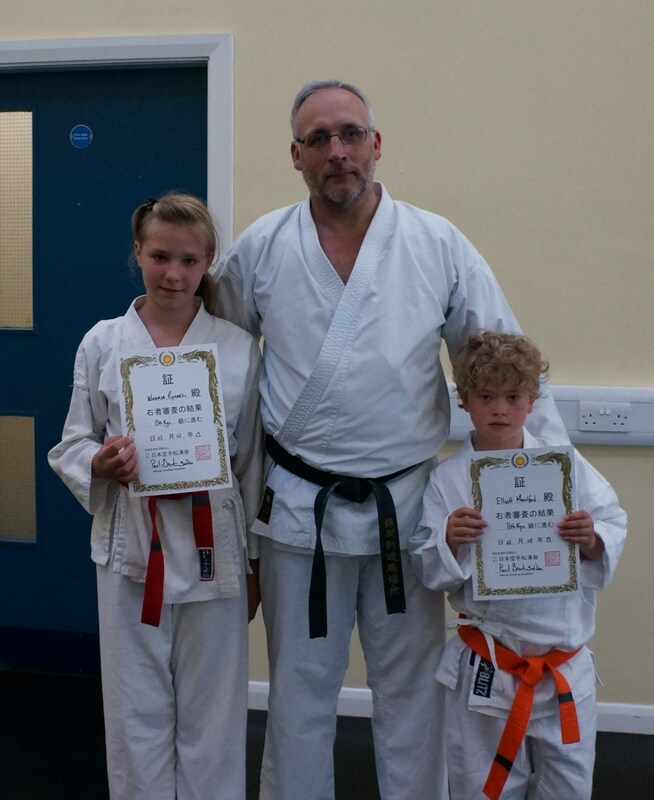 Wiktoria achieving 8th Kyu and Elliott achieving 11th Kyu, well done guys. I was very honoured that Abi shared this piece of writting with me before it is published in SKM. For me this is Karate-do, regardless of grade, age or ability, I will be suprised if these words do not motivate every single person that spares the time to read it, Osu! They say a journey of a thousand miles begins with a single step. The following words are an account of my karate journey so far. I took the first step in September 2011 and now, as a 6th kyu, my journey is still just beginning. So what does karate mean? What does karate mean to this person who frequently confuses left and right, can’t jump very high, isn’t very flexible and certainly isn’t as fit as she should be? What does karate mean to the one who never got picked for the team at school and was labelled fat and useless? What does it mean to someone who doubted their abilities in everything they did, sport and otherwise? What does it mean to someone who slogs away in the gym without ever making any progress? What does it mean to someone who has never excelled in a sport? Everything. That’s what karate means to me. I know that in time, and with a lot of effort and patience, I can solve the aforementioned issues. Well, perhaps not the confusion between left and right, but certainly the consistent feeling of being out of place in a sport. I belong in the dojo. I belong in a dōgi. I belong at training and at grading. I belong in my club and I belong in karate. My partner had been a 1st kyu for a long time and, for various reasons, had taken an extended break when I met him. Every time he spoke to me about his club and training, his eyes would light up as if he was remembering an old friend. I decided that this aspect of his life needed to be revisited. Like a pair of old comfortable shoes, he took karate out of the back of the wardrobe and dusted it off. I went along for the ride. I was expecting the same feeling of being lost as I’ve experienced so many times before when trying something new. I was expecting to struggle and make a fool of myself. I was expecting to get it wrong. And you know what? I did. I felt lost, I struggled and I got it wrong. But you know what else? It didn’t matter. Nobody smirked. Nobody judged or laughed. However clichéd it may sound, that first training session changed my life in more ways than one. Looking back, we weren’t doing anything particularly windswept and exotic. If I remember correctly we were learning how to punch with proper form and how to step forward. We did some stances and some kihon. I loved every second. I loved seeing my other half doing something he had so often talked about. He was a different person in the dojo. I saw a fire reignite in him and I knew I wanted to be a part of it. We began training frequently and as time went on, my own journey diverged from the original plan of simply getting him back to doing something he loved. We have different opinions on the many aspects of training. We enjoy different parts of sessions and struggle with different techniques. We are not a couple in the dojo, we are karateka. We have lazy days where we aren’t feeling it or we’re not sure we have enough energy, but then we dig deep and end up glad we made the effort to come along. We have an eighty mile round trip for training and without fail, even on those lazy days or after a session that didn’t quite go as we hoped, you can find us spending at least forty of those miles talking about what we’ve just done. The trip home flies by: sweaty, sore and tired. Ambitions (‘I want to learn my next kata’) and achievements (‘I did my kata!’) are shared in that journey and we learn a little bit more about each other and ourselves every time we make the trip. Frequently, I become very frustrated with my progress. This is exacerbated by life getting in the way of what I really want, as it has a habit of doing. If I had my way I would train every day but I have a job and responsibilities and in the end, it makes the times when I can focus on my karate all the more special. I still slog away at the gym but now my sessions have a purpose. I want to be fitter and more flexible to get more out of my training sessions. My gym sessions are happier and less boring when, in the back of my mind, I know my karate will benefit from the effort and my body will thank me for treating it well before pushing it to the limit and expecting it to do kata and kumite at the end of a long day at work. When the self-doubt and thoughts of ‘actually, you are rubbish at this’ start to creep in I take a look at where I was and where I now am. I might well be rubbish at karate. But does it matter? One thing karate has taught me is to only compare myself to me. Of course, when it comes to grading and competitions, this approach is not as productive but thinking of karate as a personal journey suddenly sharpens the objective up. Your journey is your own. Nobody can do it for you. Sure, you can be helped along and, in turn, help others along. Your paths will cross and some parts of the journey you will do together. For the most part, however, you will be travelling alone. What this means in a practical sense is that it doesn’t matter if someone can kick higher than me. It doesn’t matter if someone is more flexible, fitter, remembers more kata or has more medals. It doesn’t matter because I am the one I should compare myself to. Did I train hard? Have I improved? Did I put my all into that kata? Did I push myself further than last time? If the answer to these questions is yes, I am not rubbish at karate. Don’t get me wrong, it’s nice to win. I have participated in one novice competition. I won a silver for kata. I have graded successfully so far. It is nice to have some validation of what you think you know and what you think you can do but I try not to let this aspect of my journey overshadow the more important parts. Small personal victories count, too. I had never had the confidence to compete in any sport before karate. I had never felt good enough, strong enough or fit enough because I was comparing myself to everyone else. Stepping on the mat and doing a kata to the very best of my ability only requires me to look at me. This is where karate differs from the other sports I have participated in. My clubs are like a wonderful huge family. We all have at least one thing in common and everyone is valued, respected and cared for. I am consistently humbled and proud to be part of a family who accepts everyone regardless of age or grade. As my Sensei once said, we are all on our own journey, but what makes it so special is that we get to take our friends with us. We train together, laugh together, get frustrated and sometimes really rather cross together. We sweat and lose skin and get bruised together. We share happiness when one of us achieves something and we commiserate when something doesn’t quite work out. We share our stories and our lives over sore muscles and achey joints. We complain about standing in back-stance for too long and groan when our bodies won’t do what our minds expect them to. And I know I speak for every member of my karate family when I say we wouldn’t change it for the world. And so I bring you neatly back to my first question: what does karate mean? Karate means pushing yourself beyond limits you have accepted for too long and deciding you don’t need those limits anymore. Karate means facing your demons head on and winning long fought battles with your own self-doubt. Karate means digging deep even when you feel you have nothing left to give and giving it anyway. Karate means tradition. Karate means respect. Karate means belonging and acceptance. Karate means health. Karate means family. But I fear I will always confuse left and right.